Canada was a pioneer in building a composite index measuring wellbeing in a developed society. 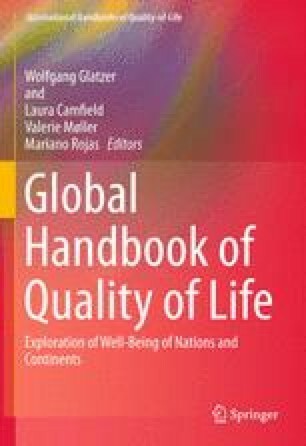 The Canadian index covers eight domains pertaining to good life: the living standards of households, health, community vitality, democratic engagement, leisure and culture, time allocation, education and the environment. Between 1994 and 2010, GDP grew by 29 % and CIW, by only 5.7 %. Overall, six dimensions increased during the 14-year period while two decreased. One of the most important improvements between 1994 and 2008 were the living standards that increased by 26 %. Followed by education (+21.8 %), community vitality (+10.3 %). Three dimensions of wellbeing showed a small improvement: democratic engagement (+7 %), health (+4.9 %), and time allocation (+1.3 %). The leisure and culture dimension has deteriorated (−7.8 %), and the environment dimension deteriorated the most (−10.8 %). Canada has a wealthy and prosperous economy, but Canadians saw only modest improvements in their overall quality of life and wellbeing at the turn of the century.